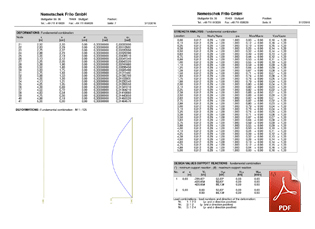 The application V1 allows the calculation of composite columns with a constant cross section in accordance with the simplified E method specified by DIN 18800 Part 5 or in accordance with EC 4 + NAD (Germany). The application performs verifications of the load bearing capacity, the serviceability and the fire safety. The user can calculate columns over a single or several storeys with any type of supports. For the quick and easy input of hinged and cantilever columns, corresponding input assistants are available. The materials are pre-defined independently of the cross section. Several options are available for the selection of the concrete, the reinforcing steel as per DIN 1045-1 and the profile steel as per DIN EN 1025 1994-03. It is assumed that the material parameters are constant on the entire system. The input of userdefined materials is not implemented. The user can arrange the reinforcement in the concrete cross section in a symmetrical layout. When entering the reinforcement, the user can decide whether the reinforcement should be included in the calculation also in the cold state. Under fire exposure, the reinforcement is always included and increases the load bearing capacity in this case. The user can define general columns over several storeys with the help of this option. In addition to the definition of two translational and two rotational degrees of freedom, the user can specify whether the support in question is a storey floor. This option is particularly relevant for the examination of the behaviour under fire exposure and is only included in the structural safety verification under fire exposure. All loads are characteristic actions. Therefore, they are entered without safety factor. You can define several hinged columns that apply at the same column point. The height of different columns may vary in any way. You can also define negative loads that apply to the hinged columns and negative heights. Appended hinged columns are taken into account as equivalent loads in accordance with DIN 1880, Part 2 E (525). The design values for the structural safety and serviceability verifications are assessed automatically by the application in line with the relevant design situation. The elastic calculation of the internal forces in a second order analysis takes imperfections via inclusion of the failure mode and creep and shrinkage effects into account. The user can control the calculation workflow via a great number of parameters. 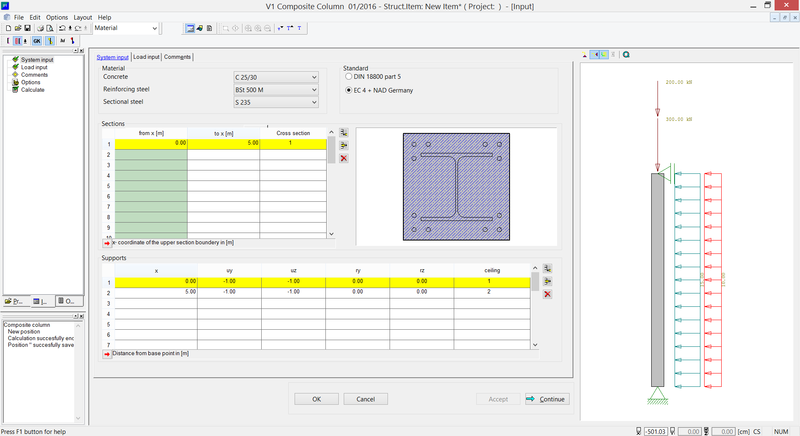 This allows the quick and easy design of various types of composite columns. Structural safety verifications in the cold state, separately for the normal and the accidental design situation. Structural safety verifications under fire exposure of concrete filled round and rectangular pipes. In order to render the input of standard systems such as hinged and cantilever columns as easy and efficient as it is with our other software applications for columns, an input dialog is available that reduces the input work to the parameters necessary for the respective system and facilitates the definition considerably.